川越 (Kawagoe) is a town in 埼玉県 (Saitama Prefecture) north of Tokyo. Kawagoe has many old traditional temples, shrines, statues and other structures standing, so it is nicknamed 「小江戸」 (Ko-Edo), whcih means “Little Edo” (Edo was Tokyo’s name centuries ago). Kawagoe has connections to the first shogun, Ieyasu. When the shogun died, his remains were brought to Nikko for burial. On the way there, a ceremony was held at a temple in Kawagoe. Ieyasu died 400 years ago…so this year’s annual Kawagoe Festival was special. About 90 minutes north of Tokyo, we went to Kawagoe yesterday. The giant floats is what Kawagoe Festival is famous for. The excitement of the festival with the floats, traditional music, crowds and food can’t be appreciated with just photos! These “lions” are a popular part of Japanese traditional culture. The “lions” will take donations to the temple…and eat it! It’s popular to let the Shishi lion “bite” your child’s head to make them “healthy and strong”. Often the kids cry. Just like when cry when they sit on Santa’s lap, they’ll get over it soon. This is a old traditional 火の見櫓 (fire watch / warning bell tower). The bell in the fire watchtower can be seen in the distance. 500 statues of Buddah. Each one has a different pose and expression. In the evening is when the Kawagoe Festival becomes more lively. When two floats meet, they “battle” for the right-of-way. The team that “loses” must back up and make way for the other team. Every October for the past ten years, there is a two-day heavy metal music festival in the Tokyo area called “Loudpark“. This year it is scheduled for 2015 October 10th (Sat) and October 11th (Sun). Loudpark heavy metal festival; 2015 Oct 10-11. Some of the major bands that are billed to play are: Slayer, Megadeth and Anthrax. Three of the “Big Four“! And then the following month, there will be another big heavy metal festival in the Tokyo area! OzzFest Japan is scheduled for 2015 November 21st (Sat) and November 22nd! OzzFest Japan 2015 will be held on 2015 Nov 21st – 22nd. Unlike Loudpark, OzzFest doesn’t have a long history in Japan. This will only be the second OzzFest in this country so far. The first OzzFest Japan ever was held in May of 2013. I went to it with a friend of mine. I saw Black Sabbath, among other bands, at OzzFest Japan 2013…and they were initially billed to headline OzzFest Japan 2015, but it’s been changed for whatever reason…Ozzy will still be playing with his solo band instead. The main acts of OzzFest Japan 2015 will be: Ozzy Osbourne, Black Label Society, KoRn Bullet For My Valentine, and Evanscence. Many restaurants in Japan have plastic displays of the menu items outside. Have you ever heard of the Japanese heavy metal band “Animetal“? 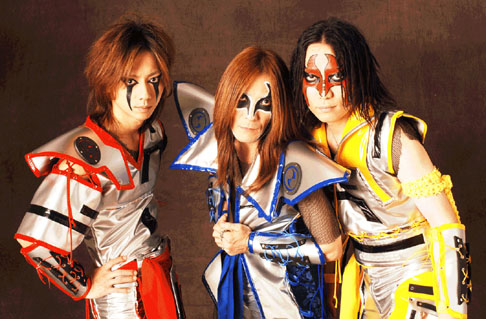 They were an extra band made just for fun by members of other established Japanese metal bands. Animetal played heavy metal versions of Japanese anime theme songs. The artwork of the cover of Animetal's first album (released in the mid-90's). Animetal disbanded about five years ago…but this year, Marty Friedman (who was the lead guitarist of the American heavy metal band Megadeth but quit that famous band so that he could live in Tokyo with his Japanese wife) helped organize the formation of “Animetal USA“. 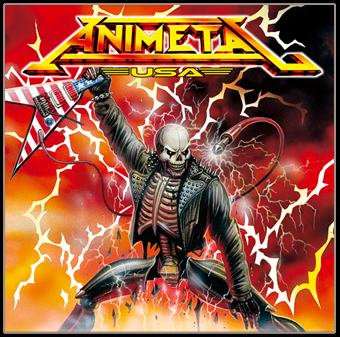 Animetal USA consists of Mike Vescera (formally the lead vocalist of the Japanese band “Loudness” for a short time), Chris Impellitteri (of the band “Impellitteri”), Rudy Sarzo (from “Quiet Riot”) and Scott Travis (of “Judas Priest”). Just like the original “Animetal”, this band sings heavy metal versions of Japanese anime theme songs…but, unlike the Japanese band, only some of their songs are in Japanese—the rest are in English. 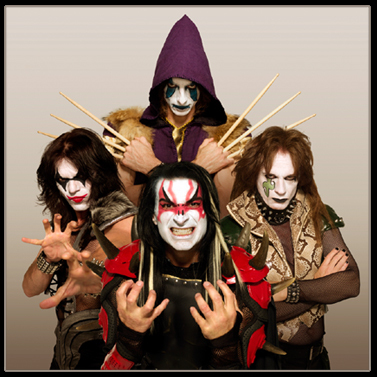 They will be releasing their debut album on 2011 October 12 and on October 15, they will perform at this year’s Loudpark Heavy Metal Festival in Saitama, Japan. The cover artwork for Animetal USA's debut album...due for release on 2011/10/12. Have you ever heard of Tokyo’s “Maid Cafes“? These cafes, mostly located in the Otaku (geek) paradise of the 秋葉原 (Akihabara) section of Tokyo, are staffed by young women dressed in “French maid” outfits who greet the customers by saying 「お帰りなさいませご主人様」 (“Welcome home, master”). They also draw cute pictures on the food with ketchup and play games with the customers. Some people say that Japan’s bar-hostesses and cafe maids are both a kind of modern-day geisha. Maybe it’s an “only-in Japan phenomenon”, but hostesses, cafe maids, and geisha all have in common that their purpose is to entertain customers (usually male) in certain eating and drinking establishments…but, contrary to a popular belief in Western countries, they have nothing to do with prostitution. Well, the financially struggling Seibu Train Line that connects 埼玉県 (Saitama Prefecture) to 東京都 (Tokyo) has decided to try and take advantage of the popularity of maid cafes to attract more passengers to use their trains. Beginning 2010 December 11, they will have a limited number of 「メイド・トレイン」 (“Maid Trains“). These trains will be staffed by “maids” similar to the ones in maid cafes who will serve food and drinks and they will also make all of the train’s announcements. Passengers will also have a chance to pay to have their photo taken with the maids (the same service is available at maid cafes). Personally I have never been to a maid cafe. And I have no plans to ride the “maid train” either. How about you? Have you ever visited one of Japan’s maid cafes? Or would you like to? Would you ride the maid train?